Well, parents, the season of indoor play is upon us. Are you ready? (I mean, is anyone ever really ready?) 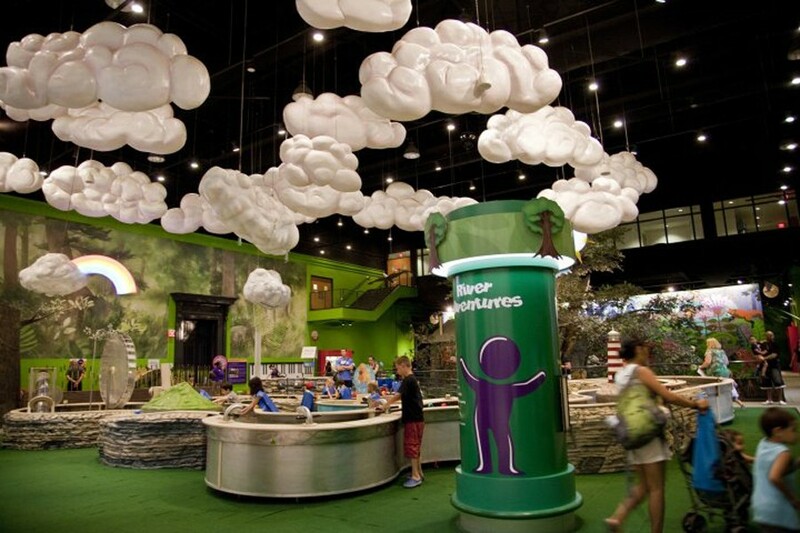 To help keep the dreaded cabin fever at bay, we’ve rounded up the most family-friendly, kid-pleasing indoor play spaces in Philadelphia and beyond — spots that range from the semi-peaceful places to burn a little energy (mini-golf! Storytimes! Toy stores!) 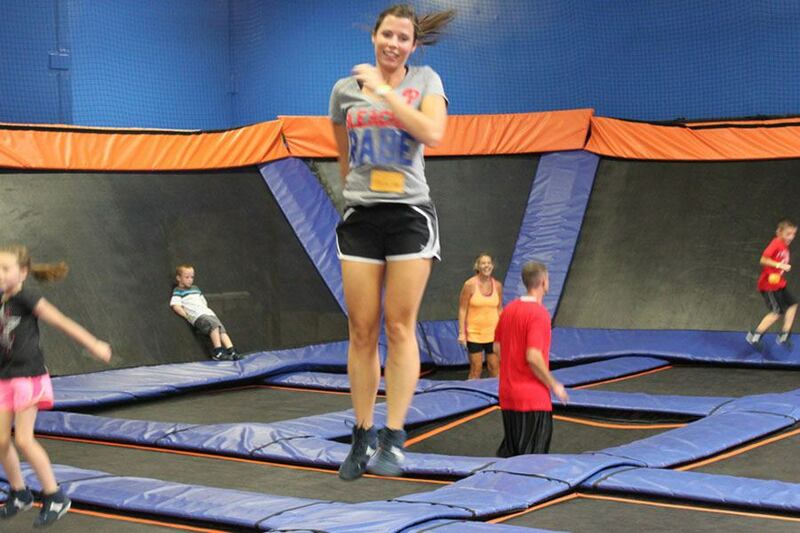 to the wild and crazy (trampoline parks! Bounce houses! Gyms! ), and everything in between, to serve all your stuck-in-the-house-with-children-and-going-nuts needs. In other words? Bookmark this page, moms and dads. Winter is here, and long, and you’re going to need it. Skip to indoor kids activities in the Philly ‘burbs. Skip to indoor kids activities in South Jersey. The play space: The huge blue warehouse that sells affordable furniture and uses a lot of umlauts also has a large play space that is … wait for it … free (!) and supervised (! ), so you can browse the wares or eat Swedish meatballs all by yourself. When the kids get bored of that (or when you’ve maxed out the one-hour time limit) take them upstairs to play in the little room vignettes and with the toys. Kids must be between 37 and 54 inches tall and potty-trained to hang out in the play space. Bonus: Lots of family-friendly stuff, like storytimes, free snacks for the tots, and sweet family parking spots that are close to the entrance. The play space: Momo’s is primarily a toy store, but the friendly owner encourages her tiny shoppers to test out all the awesome goods in the stores’ cozy play areas, which have train tables, a little kitchen, building tools, and other toys. Bonus: In the Old City location, there’s a pint-sized table with themed crafts. The play space: The original outpost of this city-kid mecca is the only space of its kind in Center City, with classes (for kids and parents), a kids’ haircut salon, a little children’s boutique, and party spaces. But parents who are simply desperate to get out of the house head straight for the downstairs, a large (by city standards), nature-themed play area with dress-up clothes, tons of toys, books and a custom-built playhouse for climbing and sliding. Parents can play or watch on seating nearby. Bonus: Healthy snacks and drinks are available. Bonus: PTM only closes two days a year: Christmas and Thanksgiving. The play space: You’ll find retro ephemera, an arcade and snacks at this scene-y, quirky, hilarious, totally fun nine-hole indoor mini-golf spot. Bonus: Kids under four get in free. Location: 54 locations around Philadelphia. Find yours here. The play space: The spaces vary, but a lot of the local branches have really warm, welcoming hangout areas for kids, complete with games, puzzles, and — obviously — a wonderful selection of free books. The Central Library in particular has an expansive kids’ section, with kind librarians, cozy seating, and an entire room set aside for the regular storytimes. Bonus: There’s a library storytime aimed at just about every demographic, from infants to toddlers to kids with special sensory needs, and more. Check out the calendar for the schedule and locations. 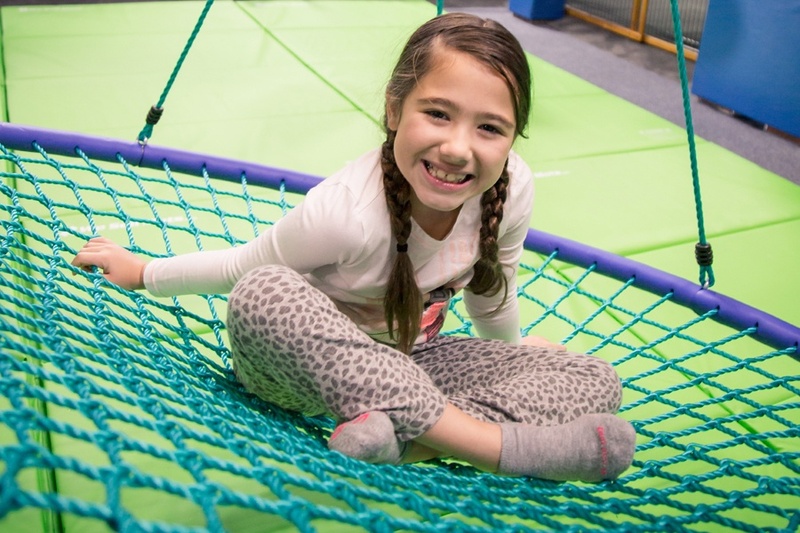 The play space: This kids’ gym — complete with a rock wall (QV location only), low balance beams, trampolines, and more — is well-known for its classes, camps and after-school programs, but it also has drop-in open gym every day of the week and on Saturdays. Check the “Our Programs” tab on the website for the open gym schedule. Bonus: Look for the occasional date night/parents’ night out on the calendar: They offer entertainment and pizza for kids ages 5 to 12, $25 a kid. The play space: This stunning 4,500-square-foot play space offers open play for littles and their families, as well as a slew of registered and drop-in classes (art, music, movement, and more), a little coffee bar and sitting area for grown-ups and an infant play area. Kids love the (handcrafted!) two-story wooden play fort, the giant train table and the cozy story corner — and parents love the beautiful light-filled space and creativity-boosting toy selection. Bonus: Cool events happen all the time — pop-up classes, readings, holiday-themed parties, after-school programs, fitness classes, and more. The play space: Here’s a nice way to kill 45 minutes and get out of the house: Wander around this adorable East Passyunk toy store, have your kid create their own “birthday bin” of wishlist toys for the next time it’s a gifting season, and let them play with the train table and castle and toys in the back of the store for a while. Bonus: Tons of crafting and science-focused toy kits available to take home for an indoor afternoon project. Bonus: Check out Smith’s website for story readings, events, craft hours and play times reserved especially for families (as in, no schools or groups). The play space: All three outposts of this cheery art studio offer art and music classes for kids, babies and adults, as well as after-school programs. (They’ve received multiple Best of Philly wins.) They also have drop-in open-studio classes at various times for newborns to toddlers (and their parents) during the week. Bonus: The Art Center is also known for their awesome birthday parties for kiddos. Bonus: Check out the mini-bookstore, which is filled with Pam’s favorite tales. Also, keep an eye on the calendar, because Miss Pam and crew have been known to do pop-up storyplay days all over the city. The play space: The indoor “multi-sensory playground” has a zip line, toddler play area, ball pits, all sort of cool swings, a kid-safe archery zone, and slides. It’s geared toward toddlers through 12-year-olds, and accepts both members and drop-ins (drop-in hours are offered every day except Saturday). Bonus: One really cool thing about this place is that it’s geared toward every child, with special inclusion of (and services geared toward) kids who need occupational therapy, speech therapy, and/or physical therapy. Many classes are designed with those goals in mind, but the classes and the play space is also just geared toward fun play and some energy-burning activity for everyone. The play space: The flamingos might be inside watching reruns of Miami Vice, but there are plenty of heated houses filled with animals and activities at the zoo in the winter. 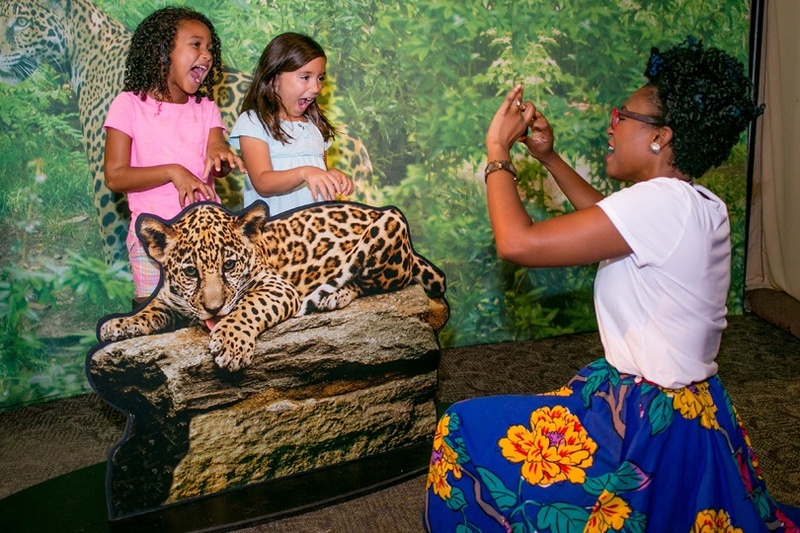 The KidZooU features a tot lot, activities, and entertainment (see rats do tricks on ropes! ); the reptile house houses all the sort of creepy creatures that kids love; the McNeil Avian Center offers colorful birds, trainers who want to chat, and a 4D theater experience; and the small mammal house contains meerkats and semi-cute furry things that like to play and hide. Bonus: Throughout the past few years, the zoo has made big changes, including encouraging more interactivity with the keepers and experts. You’ll find lots of shows and quick talks throughout the day. Also: Since the gorillas are inside for most of the winter, the Gorilla Treeway has become part of the big cats’ territory, which is good news for your little lion-lover. 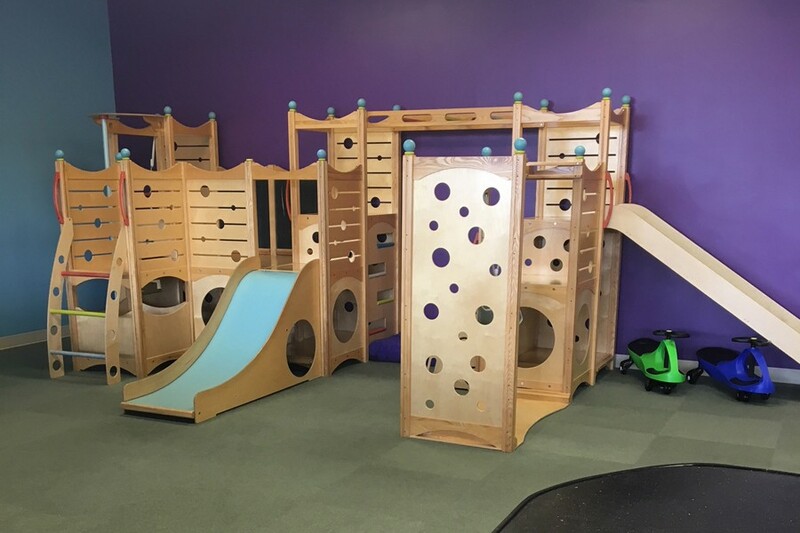 The play space: This second-story tumbling space is mostly focused on gymnastics classes for kids, but a couple times a week, they offer open play, and the kids love bouncing and cartwheeling among the tumbling equipment and on the bouncy mats. Bonus: There’s a small inflatable bounce house for open play! The play space: See the above South Philly write-up. The play space: Trampolines galore, a foam pit, a slackline, a fidget ladder, trampoline dodge ball … the list of fun ways to burn some energy seems endless. In terms of straight jumping, there’s “big air” — that’s wall-to-wall trampolines geared toward bigger kids — and there’s the “kiddie court” for kids under 46 inches. 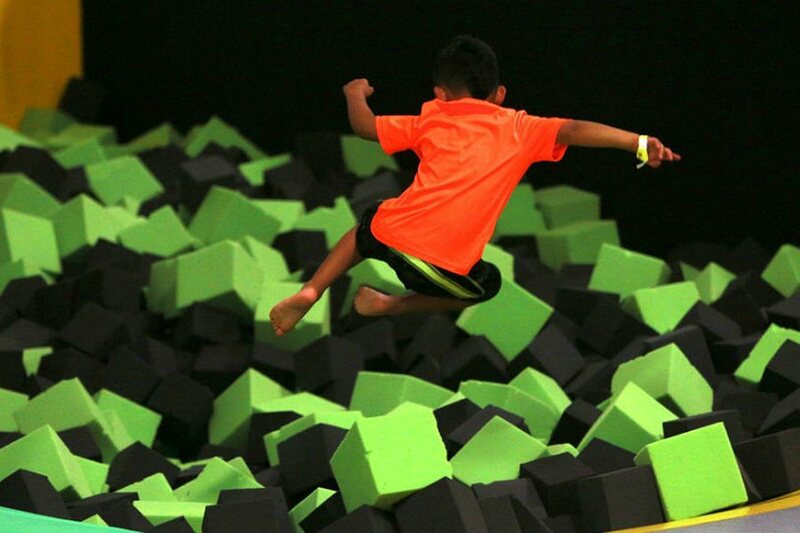 Bonus: The “ninja course” is a maze of trampolines and walls that promises endless fun for bigger kids. The play space: There are two sizable play zones inside the Brobdingnagian mall, complete with tunnels, slides, and foam structures built for climbing, plus interactive toys that encourage kids to pretend to be doctors and nurses (likely because CHOP is a sponsor). You’ll find one at the Court (near the food court) and one in the Plaza (outside of J.C. Penny). 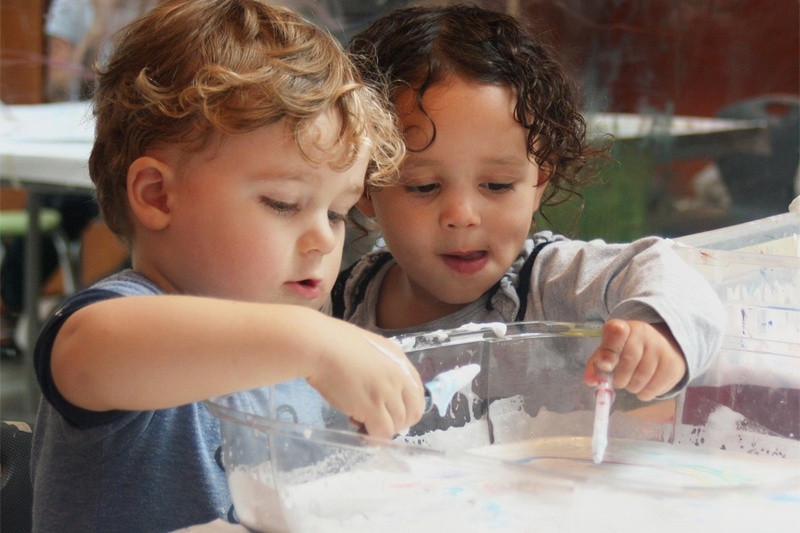 The play space: This adorable studio features classes that focus on kids really using their hands — so there’s cooking, music, art, sculpting, and more. Open studio time is built into the week; kids are encouraged to pick activities that intrigue them, from easel painting to crafts and other “tactile experiences.” Check the site for the schedule. Bonus: Got a gaggle of kids? You don’t need to fear the price tag on playtime: The Clubhouse offers a discounted price off the $10 open studio fee for each additional sibling — down to $5. 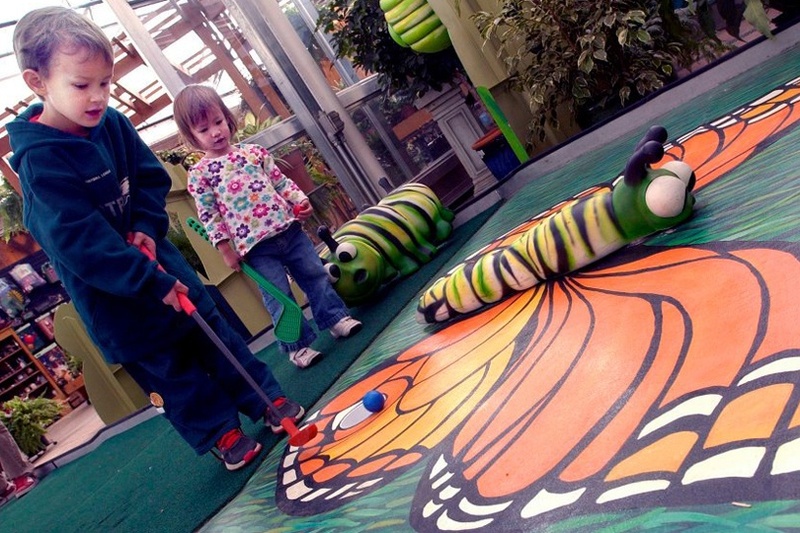 The play space: From January 13 through March 31, Linvilla and the Academy of Natural Sciences pair up to run a great little 18-hole indoor mini-golf course at the orchards. It’s called “Fore! The Planet” (each hole has an eco theme) and it’s a cozy, but not claustrophobic, experience. The natural light filtering through the space feels like a little pick-me-up. Bonus: The farm market bakery’s apple cider donuts. The play space: This cheerful 4,000-square-foot family center includes a plush babies-only area in addition to lots of space for bigger, more active toddlers and young kids — space that includes a Lego wall, a dress-up area, lots of books, and an imagination playground with huge blocks, slides, tents, a ball pit, and more. Lulu’s also boasts lots of room for parents to sit comfortably; coffee is allowed on the play floor (as long as it has a lid), and the house cafe serves La Colombe … plus breakfast and lunch food like bagels, muffins, cupcakes, sandwiches, and empanadas. Bonus: This place offers a ton of extracurriculars aside from just the usual play-space options: There are regular parent/kid meet-ups, music circles, regular kid drop-off hours, BYOB and Pizza Fridays, and so on, and on. Bonus: Oasis is open seven days a week. Locations: Suburban Pennsylvania locations include Glen Mills, Oaks and Levittown, and Chalfont; there’s also an outpost in Moorestown, New Jersey. The play space: Picture a Home Depot-sized warehouse with trampolines everywhere. Snag a pair of special orange jumping socks, and set your kid free to explore the trampoline areas, slam dunk zone, and a foam pit that feels deeper than the Pacific. The jumping areas are divided by age group, so no need to worry that your little one is going to get knocked over by a hulking 7-year-old (in fact, the house rules say that if you can walk, you can jump in safety). Check out the schedule for special events, toddler times and fitness classes for adults. Bonus: Get yourself a ticket, too. Trust us. You won’t be able to resist taking a turn. 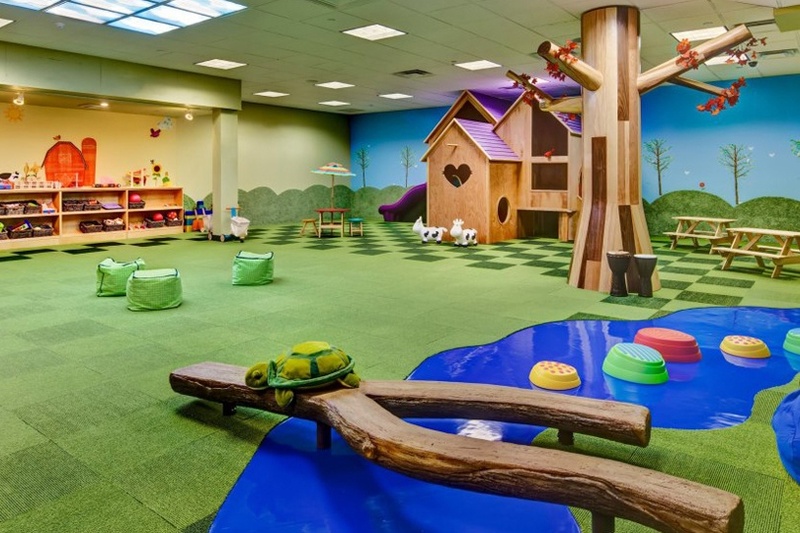 The play space: Bouncing Off the Walls offers more than just springing around indoor bounce houses (although there’s plenty of that) — make sure the kids also explore the rooms that are filled with toys and dolls, mini jungle gyms, kitchen sets, games, and more. Bonus: Every third Wednesday of the month is “friends with special needs” night. Locations: The suburban Pennsylvania outposts are in Langhorne, Horsham, Exton … and other further-flung towns, too. In New Jersey, there’s a location in Cherry Hill. The play space: Everything but the floor, walls, and ceiling in this venue (a popular national chain) is inflatable. Kids must wear socks to bounce, climb, and slide their way around. When it’s not too busy, the staff incorporates music and other elements to make it more interactive. Reservations — which can be made online — are recommended. The play space: Giggleberry Fair is a family entertainment venue that’s part of the old-timey Peddler’s Village shops. The indoor space offers several different areas aimed at different age groups; the Giggleberry Mountain is a huge, ball-tossing obstacle course; the discovery area is a play place with cool interactive elements like a giant waterway with toy boats and fountains; and the game section is like a boardwalk arcade with skee-ball and tickets that can be cashed in for prizes. There’s also a carousel and restaurant. Bonus: On Fridays and Saturdays, the place stays open until 9 p.m. The play space: See the description in the Philly ’burbs section. The play space: See the above description in the Philly ‘burbs section. The play space: In addition to a bunch of classes (music, yoga, drama …), this bright, pristine play space offers a little bit of everything for babies on up through elementary schoolers in its open play times throughout the week: mini trampolines, ride-ons, a Cedarworks play set to climb on, toys of all sorts — and a great big snack and cafe area, too. Bonus: Kids younger than 10 months are free. Also, the birthday party options are great. The play space: This large, remarkably hands-on play zone (read: No one will get bored after 45 minutes) features areas themed and sponsored by recognizable local businesses, like the Whole Foods Marlton Market, the Flyers Mini-Rink, a Subaru Service Station, a Channel 6 news area, and a California Pizza Kitchen “restaurant” where kids can get all Iron Chef. Bonus: GSDM has events just about every weekend, ranging from music and dance performances to storytelling workshops. Also, it’s open until 8:30 p.m. on Saturdays in the winter. The play space: Why aren’t there more free romper rooms at our area malls? Moorestown’s has added a small garden-themed play zone for kids, with a nice seating area for caretakers. Bonus: The mall hosts seasonal kid-friendly events — like a live butterfly show in the spring — which you can keep an eye out for here. 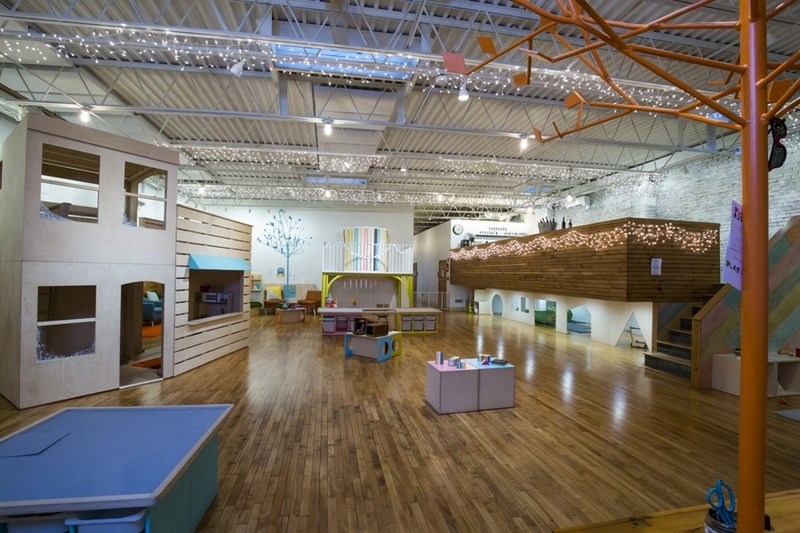 The play space: This clean, bright indoor play place has slides, toys, and places to tumble. Open play is offered many days (including Saturdays! ), but the organized class system is easy, too: Pay $70 and drop into one age-appropriate class a week; pay $80 and take as many as you want a month. Bonus: A cafe — complete with grown-up seating area — sells good, fresh food like hummus and grilled cheese. 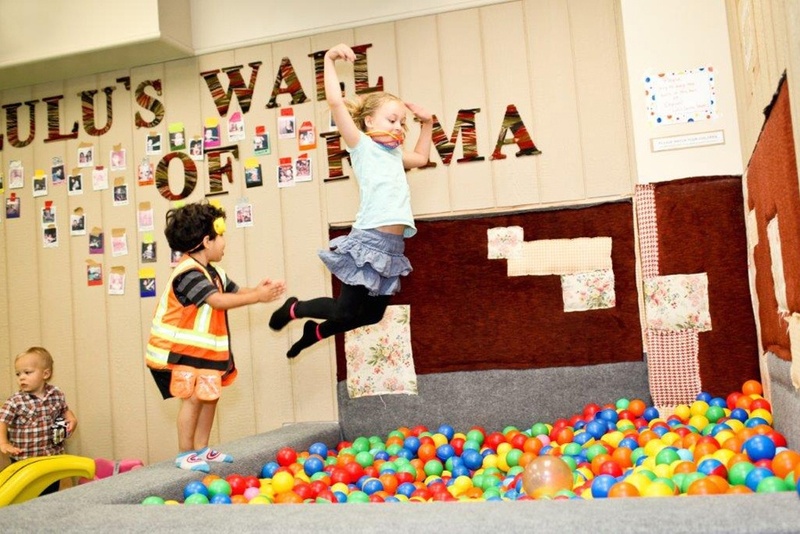 The play space: A brightly colored play space aimed at kids five and under, Jellybean Jungle has a whole bunch of amusements aimed to thrill the toddler set: jungle gyms, a mini ball pit, puzzles, games, dress-up clothes, and more. And there’s open play every day but Sunday. This post originally appeared on Wee Wander, a site dedicated to helping Philadelphia parents navigate their city. See more in this series here, or keep up with all of Wee Wander’s tips, guides and Philly related parenting help on Facebook or Instagram.